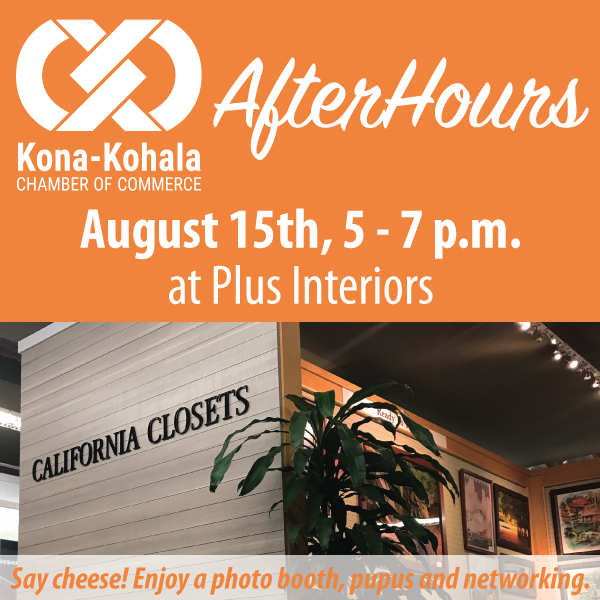 The public is invited to the Kona-Kohala Chamber of Commerce’s networking event, AfterHours, on Wednesday, Aug. 15, 2018, from 5 to7 p.m. located at Plus Interiors, located at 75-1006 Henry St. This “Say cheese!” themed pau hana will feature a photo booth and other photo opportunities for attendees. Learn about Plus Interiors different divisions and lines: Pictures Plus, California Closets, The Sliding Door Company, Exotic Woodlines and the new CocoNene line. 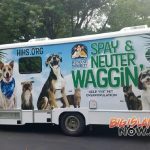 Tour the newly renovated cabinet, sliding door and closet showroom and talk story with Chamber member businesses from all across West Hawai‘i. Attendees who register before Aug. 1, are invited to submit an image for a free custom gift with their image printed on aluminum, wood and a luggage tag ($40 value). The gifts will be ready for pickup at the Aug. 15, event. 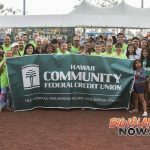 The Chamber’s monthly AfterHours—which meets every third Wednesday of the month—is a networking event for attendees to build their professional networks by connecting to the West Hawai‘i business community. General admission is $30; $15 for Chamber members and first-time non-members. Registration and prepayment is required; register is available online. For information, contact the Chamber at (808) 329-1758 or info@kona-kohala.com.